In a racing powerglide transmission, the high gear drum is an important area to consider when doing high performance upgrades. 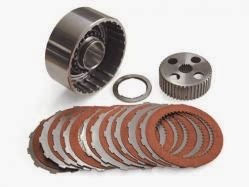 In OEM applications, the high gear drum is stacked with 4 to 5 friction and steel clutches. Our quick tip guide details the method for cleaning up the OEM drum and preparing it for a racing setup. Using standard thickness clutches and a standard height clutch hub, six (6) friction and steel clutches can be installed in an OEM powerglide high gear drum. However, this capacity can be increased to eight (8) clutches using a machined piston and thinner .060" steel and friction clutches. Using an aftermarket drum and taller clutch hub, you can achieve an even greater 10 clutch capacity. These recommendations are assuming the transmission line pressure is at least 220 lbs.